Heat oven to 350°F. Place paper baking cup in each of 24 regular-size muffin cups. Make and bake cake as directed on box for cupcakes. Cool completely and frost. Unroll and remove paper from Betty Crocker Fruit Roll-Ups snacks labeled Blazin' Blue/Green. To make paw prints, use small kitchen scissors to cut out from blue portion of Fruit Roll-Ups for "pad" area of foot about 1 1/4 inches wide and 1 inch long; place on cupcake. Place 4 Betty Crocker Fruit Gushers snacks on each cupcake to look like toes of paw print. 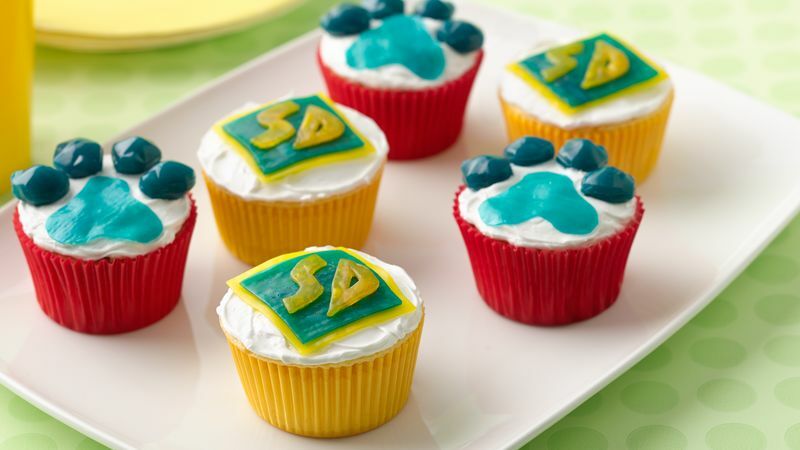 To create "Scooby-Doo™" cupcakes with the letters S and D, unroll and remove paper from Fruit Roll-Ups snacks labeled Sizzlin' Red/Yellow and Blazin' Blue/Green. Cut out yellow square and top with slightly smaller blue square and place on frosted cupcakes. Using small kitchen scissors, cut out letters S and D from yellow portion of Fruit Roll-Ups to place on top of square on cupcake; attach with small amount of water. Use other colors of Fruit Roll-Ups snacks and Fruit Gushers to make different colored paw prints.